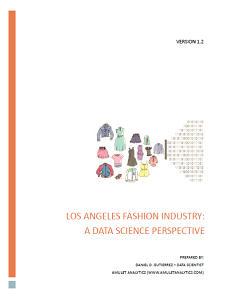 Over the past year, I’ve been working on a new research project that culminated with a whitepaper in support of the Los Angeles fashion industry – “Los Angeles Fashion Industry: A Data Science Perspective.” The work was done in collaboration with LA’s premiere fashion mart, The New Mart. The paper is in response to numerous stories found in the local apparel industry trade press that held the sentiment that LA fashion had seen better days and was on a downward slide. We decided to use privately procured and publicly available data sets to find a single truth surrounding this matter. The whitepaper’s position is quite the opposite – LA fashion is a Los Angeles mainstay and continues on an upward trajectory. See for yourself by downloading the paper HERE.